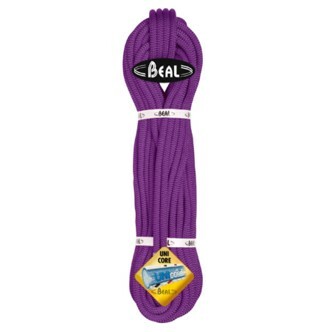 The new Beal Wall Master rope with Unicore in a girlie violet. Do you have a girlfriend, sister, mother or grandmother who is more adventurous than traditional? If so, you may have already stumbled a few times choosing a gift. If she prefers backpacks to Coach bags, or wet suits to evening gowns, this article will help you get started on your shopping list. Since an active woman likely has sporting equipment already, consider how you could upgrade her gear with newer, lighter, or more high-tech options. For example, in recent years tents have become dramatically lighter and simpler to pitch. Replace her old tent with one that weighs a couple pounds less, and you will be a hero the next time she goes backpacking! If she likes feminine colors, everything from knives to climbing rope comes in “girlie” shades and patterns. The added benefit is that most men won’t walk off with pink gear. Here are few ideas organized by price. The manufacturers and models listed below will get you started, but there are many more good choices available. Matching Carabiners – Omega Pacific offers 25kN carabiners in silver, blue, orange, gold, sea foam and pink gated – $7 – $14 each. Rappelling Gloves – PMI and Liberty Mountain both offer natural and black for around $30. Titanium Backpacking Mug – Weighing just over two ounces, choose a double walled model if she likes hot drinks on the trail – $30 – $50. LED Headlamp – The Spot by Black Diamond lasts a minimum of 20-hours on a set of batteries and lights up to 43 meters. It has a tiltable housing which makes it a good pick for climbers, skiers and other backcountry travelers – $40 – $50 depending on color. Try the Moxie or Wiz for girlie prints/colors. Buff Headwear – These multifunctional fabric tubes come in many styles, fabrics and colors. You’ll end up buying one for yourself! – $22. Small Multi-Tool – The Leatherman Squirt comes in five colors, is small enough to attach to a key chain and weighs just 2.25 ounces – $40. Figure 8 or Bar Rack (for rappelling) – CMI offers their Sport Rack for $82 or check out their Figure 8s for $25 – $48. Backpacking Stove – The Soto OD-1R Butane stove and the MSR Whisperlight liquid fuel stove have both received good reviews from Backpacker and Backpacking Gear Review – $70 – $80. Light-weight Cooking Pot for Backpacking – Non-stick titanium construction offers a combination of lightweight and easy cleaning. Try the Ti-Light kettles offered by Vargo – $59 – $67. Wrinkle-free Travel Dress – Travel Smith offers a wide selection for around $100. Silk Long Johns – Silk long johns offer light-weight and bulk while doing a great job of insulating. Some styles have lace cuffs or prints for a feminine touch. Winter Silks is the leader in this market in both quality and selection (this author’s opinion) – $60 for a set. Several of the following ideas may require personal selection by the adventurer. You could print a “gift certificate” for the item and wrap it in shoebox to give her something to unwrap. SPOT Satellite GPS Messenger – This lightweight device not only sends SOS calls, but also custom messages and “I’m okay” check-ins to friends and family – $170 + $100 per year subscription. Sleeping Bag – Bags wear out and there isn’t a bag that’s perfect for every trip. If she camps or backpacks a lot but has only one bag, there’s a good chance she could use another. For example, a very warm bag is uncomfortable in summer heat and is heavy. Prices vary widely. GPS/Camera Combo – Garmin debuted the Oregon 550 last year, which includes a 3.2 megapixel camera with 4 x digital zoom and 850 MB of memory. This allows geo tagging the location of each photo – $499. Tent – Like sleeping bags, there is no one perfect tent. Depending on the season, how many people in the group, and whether the trip is car camping or backpacking, the tent selection can change. Big Agnes and MSR offer high quality, ultra-light tents. Prices vary. Wet Suit – Again, temperature is an important consideration in the selection of wet suits, which come in many weights, styles and colors. Unless she has shared a particular suit that’s on her wish list, take her shopping. Prices vary. First Aid Kit – Each traveler has a different comfort level when it comes to first aid kits. I have noticed that the more medical training the traveler has, the bigger the kit. Kits vary depending on the length of the trip or the number in the group. Adventure Medical offer a wide selection and supports their buyers with refill kits for a reasonable cost. An excellent choice is the Fundamentals kit by Adventure Medical – $110 or the Weekender – $60. Thanks Amy! Now if I can get my family to read the post I might SCORE! Love that double walled titanium mug! Wish I had one (hint, hint). Me too…. think they will notice??? I absolutely love buffs! I think they need to get some more “fun” patterns, but seriously I don’t know how I would ever fish without mine. Err well I know that I would but I’d apply sunscreen 400 times more often, and probably still end up being a lobster.